There are two types of bone marrow: red marrow (consisting mainly of myeloid tissue) and yellow marrow (consisting mainly of fat cells). Red blood cells, platelets and most white blood cells arise in red marrow. Both types of bone marrow contain numerous blood vessels and capillaries. At birth, all bone marrow is red. With age, more and more of it is converted to the yellow type. About half of adult bone marrow is red. 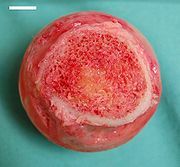 Red marrow is found mainly in the flat bones, such as the hip bone, breast bone, skull, ribs, vertebrae and shoulder blades, and in the cancellous (“spongy”) material at the epiphyseal ends of the long bones such as the femur and humerus. Yellow marrow is found in the hollow interior of the middle portion of long bones. In cases of severe blood periods, the body can convert yellow marrow back to red marrow to increase blood cell production. The stroma of the bone marrow is all tissue that isn’t directly involved in the primary function of hematopoiesis. The yellow bone marrow belongs here, and makes the majority of the bone marrow stroma, in addition to stromal cells located in the red bone marrow. Yellow bone marrow is found in the Medullary cavity. The blood vessels constitute a barrier, inhibiting immature blood cells from leaving the bone marrow. Only mature blood cells contain the membrane proteins required to attach to and pass the blood vessel endothelium. Hematopoietic stem cells may also cross the bone marrow barrier, and may thus be harvested from blood . The bone marrow stroma contain mesenchymal stem cells (also called marrow stromal cells). These cells are multipotent stem cells that can differentiate into a variety of cell types. Cell types that MSCs have been shown to differentiate into in vitro or in vivo include osteoblasts, chondrocytes, myocytes, adipocytes, and, as described lately, beta-pancreatic islets cells. They can also transdifferentiate into neuronal cells. There is biologic compartmentalization in the bone marrow, in that certain cell types tend to aggregate in specific areas. For instance, erythrocytes, macrophages and their precursors tend to gather around blood vessels, while granulocytes gather at the borders of the bone marrow. Mesenchymal stem cells are found arrayed around the central sinus in the bone marrow. They have the capability to differentiate into osteoblasts, chondrocytes, myocytes, and many other types of cells. They also function as “gatekeeper” cells of the bone marrow. To diagnose diseases involving the bone marrow, a bone marrow aspiration is sometimes performed. This typically involves using a hollow needle to acquire a sample of red bone marrow from the crest of the ilium under general or local anesthesia. The average number of cells in a leg bone is about 440,000,000,000. Exposure to radiation or chemotherapy will kill many of the rapidly dividing cells of the bone marrow and will therefore result in a depressed immune system. Many of the symptoms of radiation sickness are due to damage to the bone marrow cells. A Wright’s stained bone marrow aspirate smear from a patient with leukemia. Bone marrow examination is the pathologic analysis of samples of bone marrow obtained by bone marrow biopsy and bone marrow aspiration. Bone marrow examination is used in the diagnosis of a number of conditions, including leukemia, multiple myeloma, anemia, and pancytopenia. The bone marrow produces the cellular elements of the blood, including platelets, red blood cells and white blood cells. 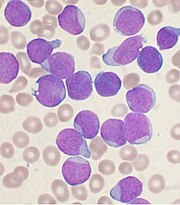 While much information can be gleaned by testing the blood itself (drawn from a vein by phlebotomy), it is sometimes necessary to examine the source of the blood cells in the bone marrow to obtain more information on hematopoiesis; this is the role of bone marrow aspiration and biopsy. It is possible to take hematopoietic stem cells from one person and then infuse them into another person (Allogenic) or into the same person at a later time (Autologous). If donor and recipient are compatible, these infused cells will then travel to the bone marrow and initiate blood cell production. Transplantation from one person to another is performed in severe cases of disease of the bone marrow. The patient’s marrow is first killed off with drugs or radiation, and then the new stem cells are introduced. Before radiation therapy or chemotherapy in cases of cancer, some of the patient’s hematopoietic stem cells are sometimes harvested and later infused back when the therapy is finished to restore the immune system. The Anthony Nolan Trustplays a vital role with regards to finding donors. They connect one person, whose immune system needs a boost – with another person, who is prepared to share a little of theirs. Matching patients with donors. The stem cells are harvested directly from the red marrow in the crest of the ilium, often under general anesthesia. The procedure is minimally invasive and does not require stitches afterwards. Depending on the donor health and reaction to the procedure, the actual harvesting can be an outpatient procedure or requiring 1-2 days of recovery in the hospital. Another option is to administer certain drugs that stimulate the release of stem cells from the bone marrow into circulating blood. 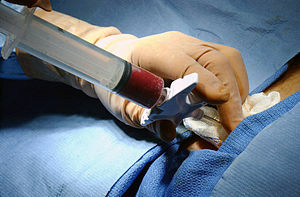 An IV is inserted into the donor’s arm, and the stem cells are filtered out of the blood. The procedure is similar to donating blood or platelets. It may also be taken from the sternum. The tibia may seem a good source, since it is very superficial. However, except in children, this bone marrow doesn’t contain any substantial amount of red bone marrow, but rather only yellow bone marrow. Many cultures utilize bone marrow as a food. The Vietnamese prize bone as the soup base for their national staple phở; Alaskan Natives eat the bone marrow of caribou and moose; Indians use slow-cooked marrow as the core ingredient of the Indian dish Nalli Nihari; Mexicans use beef bone marrow from legs bones, called tuetano, which is cooked and served as filling for tacos or tostadas; it is also considered to be the highlight of the Italian dish ossobuco (braised veal shanks). Though once used in various preparations, including pemmican, bone marrow for human consumption in the United States has recently fallen out of favor as a food. One fan of this delicacy is noted chef and author Anthony Bourdain, who has stated that if he were on death row, his last meal would consist of bone marrow. He considers the delicacy to be his number-one comfort food. Bone marrow is a source of protein and high in monounsaturated fats. These fats are known to decrease LDL cholesterol levels resulting in a decreased risk of cardiovascular disease, prompting some to make bone marrow a dietary staple. The actual health effects of the addition of bone marrow to the diet remain unclear. Diners in the 18th century used a marrow scoop (or marrow spoon), often of silver and with a long thin bowl, as a table implement for removing marrow from a bone. Some anthropologists believe that early humans were scavengers rather than hunters. Marrow would then have been a major protein source for tool using hominids, who were able to crack open the bones of carcasses left by top predators such as lions. It was very interesting for me to read that blog. Thanks for it. I like such themes and everything connected to them. I definitely want to read a bit more on that blog soon. It was extremely interesting for me to read that post. Thanks for it. I like such topics and everything connected to them. I would like to read more on that blog soon. BTW, pretty nice design you have at that blog, but how about changing it once in a few months? I definitely want to read a bit more soon. By the way, rather nice design you have at that site, but what do you think about changing it once in a few months? Indeed cool story you have here. I’d like to read a bit more about that topic. Thanx for giving this material. Rather nice site to spend some time on reading it to my thinking. BTW, why haven’t you you send this post to social bookmarking sites? That will bring much traffic to this page. If you would like to share my blogs article.Please do so. Maybe you will get a better insight in our feelings and hopes. God bless all the people who help other people. Thank you, so much for reading the article all the way from Poland. Thanks to the technology we can access great content online.